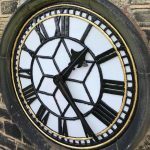 We’ve manufactured over 12,000 new clocks for our UK and overseas markets, working in partnership with architects and designers, for commercial and public bodies, transport and churches. Our new clocks are custom designed and built, with almost no upper limit to size. All our drive mechanisms are manufactured in-house. 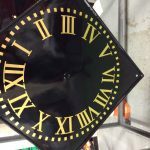 As clock repair and dial restoration specialists, the preservation and conservation of your clock is at the heart of our business. Our team of experienced clockmakers are stationed around the country, giving our clients the peace of mind that we’re never far away. We’re proud to service and preserve time on 4,000 clocks in the UK and overseas. Our clock servicing protects the longevity of your clock for your community to enjoy for many generations to come. Thank you for the quotation from Martin Butchers, which I shall take forward to our next PCC meeting for consideration and thank you also for Jonathan Lee’s kind attention while carrying out his inspection of the clock drive. Thank you for the work carried out so far. Everyone at school has expressed their delight at hearing the bell chime. I would like to record my thanks to Paul for his professionalism and can do attitude. It’s great to finally have the clock striking again. I cannot say how much I was pleased by Eric’s professional skills in his near week of work to restore our much admired timepiece, and the return of the clock chimes and strikes has provoked much appreciation from our hamlet. Firstly may I commend the workmen you assigned to repair our clock, they were very professional, efficient and diligent in carrying out the repairs needed. I would like to request that for future servicing and repairs that we would like this engineer to attend as he has been the most thorough in carrying out his work and knew what had to be done. Dear Julie, Matthew duly came and fitted everything in the Church earlier this week, and I am delighted to say that John Wilding, our resident clock keeper, informs me that the clock is keeping time to the second on every strike. He is very pleased! Will you please pass this on to Matthew and say how much we appreciated his efficient work. I hope he enjoyed his visit to our village. Kind regards, John. We’re so pleased with the clock repair work carried out by local clockmakers Mike Tomlinson and Kevin Ireland. We will 100% recommend Smith of Derby Clockmakers to our friends in the future. Both clockmakers are a credit to your company and they’re very professional in what they do. We were worried that our Dance Studio would be affected by the work but this wasn’t the case at all. Everything ran so smoothly. We are extremely pleased with the pavilion refurbishment and in particular the clock which blends perfectly with the style of the pavilion. I can, in all honesty, say that this was the best ‘works visit’ I have ever been on. The range of skills which your staff display is truly wonderful; if possible please let them know of my comments. Chairman of the Sheffield branch of the B.H.I. Firstly I would like to start by saying thank you for all you help on providing our company with a truly wonderful clock and at such short notice. You have gone above and beyond in helping us and have provided a top quality service and product which we are very grateful for and thus has helped us make the decision that for all future jobs that require your product we will be using Smith of Derby for all our needs. Administration Manager. The Construction Project Ltd.
We would like you to know how much we appreciated the ‘Tour and Talk’ that you organised for us yesterday. We went away with a much better appreciation of what Smith of Derby is capable of. We were impressed by what a friendly team you all are, not just you and the management but everyone we came into contact with greeted us with a smile and every courtesy. Our cabinet members were very impressed when we went to have a look earlier. It is fantastic to see the clock back in Bearwood and I know it means a lot to members of the local community. The clock looks wonderful now after being extensively restored by the world-renowned clock restorers Smith of Derby. Local residents have been telling me that they want Little Ben returned to pride of place at Victoria for years. A massive thank you to Transport for London for their commitment to delivering this and to Smith of Derby for the superb job they have done on the restoration. I am delighted that the works on the Guildhall Clock are now complete, returning this iconic landmark to its former glory. We are all very proud of the completed repairs to our church tower, clock and flagpole, which you have helped us achieve. The excellent quality of this work is clear for all to see and it has given a lift to our village and those who live in it. For this we thank you for the important part you played in the restoration. It started with an apprentice: John Smith began his career with the Whitehurst clockmaking company. From these beginnings, our family company has grown to become one of Britain’s largest and oldest clock manufacturers, and a major player on the timekeeping world stage. We are proud of the heritage of our names in our group of companies: John Smith & Sons (1856); William Potts & Sons (1833); James Ritchie & Son (1809) and J.B. Joyce & Co (1690).